1. Add the orange juice, grated rind, sugar and butter into a 9 inch pan. 2. Place over moderate flame and simmer for 3 to 4 minutes. 4. Place the bananas in the syrup and simmer for one more minute. 5. Turn and cook on the other side for 30 to 60 seconds. 6. Pour the rum in a small pan and warm over low heat for 10 to 20 seconds. 7. To serve, place the syrup pan over a lighted spirit lamp and set alight the rum. 8. Pour this over the bananas and serve as soon as the flames die down. 9. Spoon over the syrup and garnish with cream. 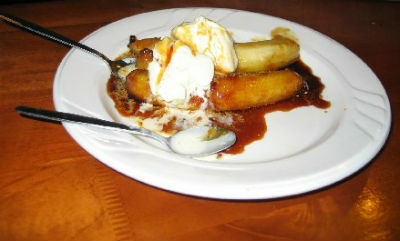 Feel free to comment or share your thoughts on this Banana Flambe Recipe from Awesome Cuisine.